It is true to say that Thailand is better known for its food rather than its beer, but there are a number of locally produced beers that visitors might enjoy during their trip to Thailand. One of these is Singha beer which is often marketed as being the national beer of Thailand with the tagline, ‘beer Singha, beer Thai’. 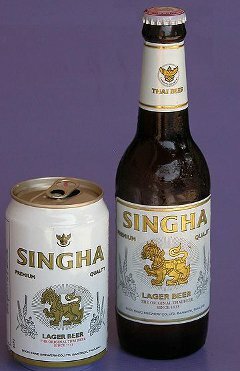 The word Singha refers to the mythical golden lion which can be seen on the front of bottles or cans of the brew. In the Thai language, the word for this creature is pronounced ‘sing’ without the ‘ha’ at the end. It is just in the Romanized version that it is written as Singha or Singh. Incidentally, the Thai word for lion (of the type you would see at a zoo or in Africa) is sing-dtoo. The creator of Singha beer was Boonrawd Sreshthaputra who was born in Thailand in 1872. Boonrawd was educated at home by his father until the age of 11 before completing his schooling at the local temple where he was taught by monks. Boonrawd worked as a teacher and as a clerk before opening a small ferry business in Bangkok. He had the idea of making a Thai-made beer and visited Germany and Denmark to learn more about the brewing skills he would need. Boonrawd realized his dream in 1933 when the first bottle of Thai beer, Singha, was produced by his Boon Rawd Brewery. The Thai entrepreneur went on to become involved with a number of charities and became a member of the Siamese aristocracy with King Rama VI bestowing him the title Phraya Bhirom Bakdi. He died in 1950 aged 78, but the Boon Rawd Brewery remains privately owned and the founding family still hold a majority shareholding. How Strong is Singha Beer? Singha is a lager beer brewed with barley and malt and comes with a 5% alcohol-by-volume tag (formerly 6%). There is also a lighter version, Singha Light, which is 3.8%. If you are in a tourist area it’s common to hear visitors asking for a ‘singer beer’ and the person serving will almost certainly understand the request. However, the correct pronunciation in Thai is ‘bia sing’. If you listen to a Thai person ordering one bottle of Singha you may hear them say, ‘ao bia sing neung kluat’ with the addition of the polite ‘khap’ or ‘ka’ at the end of the request. The person serving may ask if you want a small (lek) or large (yai) bottle (kluat). The Thai way to drink beer is usually in a glass with ice and if you are in a restaurant rather than a bar, ice (nam-kheng) will normally be provided for your table in an ice-bucket. In some bars and pubs in Thailand, Singha is available on draft, but more commonly it is sold in bottles. Putting ice in your beer may be sacrilegious to some people, but on a hot night in Thailand it can be very refreshing and is worth a try at least once during your trip. Prices vary, but in an average bar or pub expect to pay approximately 70 to 100 Baht for a small bottle of Singha. You can buy Singha in cans or bottles more cheaply from supermarkets or 7-Eleven stores if you fancy a quiet drink on the balcony of your hotel or in your guest-house room.